IceBarcelona is an ice bar located on the beach. A visit to this bar is a fun experience for the whole family. With sub-zero temperatures, hot and cold drinks in glasses made of ice, you are guaranteed to have an interesting time. 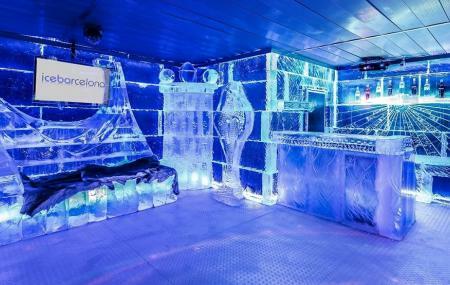 The walls are made of ice and the ambience is created with neon lighting and impressive ice sculptures. If you have been to an ice bar before, you know what to expect. However, if this is you first time be prepared to be truly delighted. Enjoy both alcoholic and non-alcoholic drinks and dance to the music. After the ice bar head out to the terrace and continue the evening with beautiful views of the beach. Ticket includes one drink and warm clothing (jacket and gloves). Wear appropriate shoes as it is cold and the bar does not provide footwear for hygiene reasons. It is advisable to book prior to your visit especially on weekends and for night visits. The visit lasts for 45 minutes, beyond that you ma remain depending on crowd. Children are permitted up to 11 pm only. People normally club together Barcelona Zoo and L'Eixample District while planning their visit to Icebarcelona. Poor. £17 a ticket which gives one drink and you can only choose from abiu 5 cocktails and one beer. Then you are taken into what is basically an industrial freezer with some ice sculptures. There is nothing to do and no opportunity to buy further drinks. We were given an hour and actually we just stayed 15 minutes. Lovely staff but basically a tourist con. It’s nice to visit but it’s just a small cold room ! Expected something better.